I’m sure you’ve heard of Double Fine by now. The main figure behind the studio is none other than Tim Schafer. The game designer responsible for classics like Monkey Island, Full Throttle, Grim Fandango and more recently, Psychonauts and Brütal Legend. With such an acomplished and obviously talented leader at the helm, saying expectations for the studio are high is certainly an understatement. 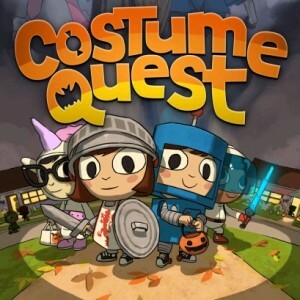 So when Double Fine reveals its sources of inspiration for their newest downloadable title Costume Quest, we pay attention. Hit the jump to know what they are. Homemade costumes – The developers cited their love for Halloween while growing up and the homemade costumes parents made for them a major source of inspiration. The movie “Labyrinth” – The goblins in Labyrinth were a reference while designing the enemies in Costume Quest. This was also the case for their home town in the game. The anime films by Hayao Miyazaki and Studio Ghibli – Studio Ghibli’s films were often used as reference while crafting the cell-shaded look of the characters and scenery. Legend of Zelda – The Windwaker – Nintendo’s game was used as a source of inspiration for its simplistic look while still retaining characters that remained expressive, even when the game lacks voice-over. Earthbound – Another Nintendo game, picked this time for its map layout and quirky humor. Those are awesome sources of inspiration if you ask me. You can download Costume Quest on the Xbox Live Marketplace on October 20th at 1200 Microsoft Points.